Overflowing with chocolate, this brownie is intoxicating! Hand cut from Simply Divine Brownie base, then dipped in sweet dark chocolate, we hand decorate the mug so it is perfect for every toast you make. Cheers! 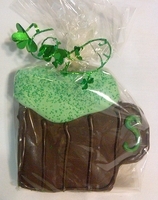 Each mug is individually wrapped in cellophane, then tied with a ribbon. Order a six pack! Ingredient Base: Dark brown sugar, unsalted butter, fine chocolate (unsweetened and semisweet), eggs, enriched bleached flour, vanilla, kosher salt, baking powder.